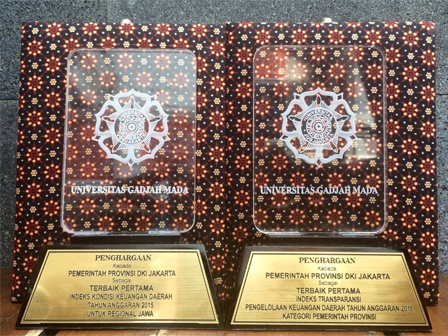 " We're committed to reform financial management"
Jakarta Provincial Government got two awards from University of Gadjah Mada (UGM) Yogyakarta. The first award was achieved for the first best Financial Condition Index (IKK) 2015 Java Regional. As for the second was achieved for the first best Transparency Index of 2016 Regional Financial Management. Both awards were officially handed over directly by UGM Rector, Panut Mulyono and Expert Staff for Home Minister, at Graha Sabha Pramana, UGM Campus, Yogyakarta. Jakarta Financial Management Board (BPKD) Head, Michael Rolandi C Brata expressed that the award was given for the success of the city in terms of various financial management innovations that are transparent, effective, efficient and accountable. "We're committed to reform financial management," he stated, Thursday (9/7). He explained transparency of management and use of the budget is done well through the implementation of systems and information as a tool of local government in planning, implementation, reporting and accountability. "We publish everything on our website. For planning, we have e-budgeting. Then for the implementation we have the Regional Financial Management Information System (SIPKD), as well as reporting and IT information system," he explained. Additionally, he continued the city has applied a non-cash payment system. This innovation of financial management is done in order to realize good governance. "Through these awards, the people can know that the city already has good innovations and be the best in terms of transparency," he stated. As for the information, there are seven dimensions of IKK calculation method. They are short-term solvency, long-term solvency, budget solvency, service solvency, operational solvency, financial independence, and financial flexibility. Meanwhile, the method of calculating the Regional Financial Transparency Index is including the planning stage, implementation phase, reporting stage, and accountability stage.